The former federal courthouse in downtown Buffalo is again active, serving as the new home of both the Buffalo Police and Fire Departments. A dedication ceremony was held Thursday morning, beginning with the police department formally decommissioning its longtime home just a few blocks away. The City of Buffalo acquired the former Michael J. Dillon U.S. Courthouse from the federal government in late 2016, for the price of just one dollar. Thursday's ceremony celebrated completion of a goal to move Buffalo's public safety resources into a singular space. 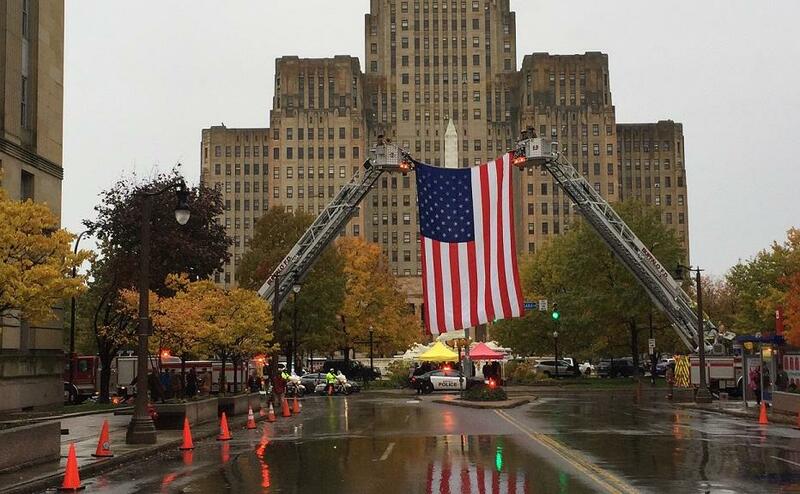 A procession from the former Buffalo Police Department merges with Buffalo Fire officials and elected officials beneath a giant flag in Niagara Square, before all proceeded inside the new Buffalo Public Safety Headquarters inside the former Michael J. Dillon US Courthouse, seen at far left. "Establishing a joint police-fire public safety headquarters has been a goal of my administration and this special building, with its strategic location on Niagara Square, was just what we were seeking," said Mayor Byron Brown during his ceremony remarks. The ceremony began a few blocks away at the corner of Franklin and Church Streets, atop the longtime home of the Buffalo Police Department. In rainy weather, bagpipes played from the rooftop as officials lowered the U.S. flag from its pole for the last time, formally closing the facility it called home since 1937. Pipers and drummers then led a procession along Franklin Street to Niagara Street and into Niagara Square, where police and fire officials met and then marched beneath a larger Old Glory held up by a pair of fire trucks. "Bringing the leadership and staff of both the Buffalo Fire and Police Departments, under one roof, will foster a multitude of benefits and possibilities for both organizations," said Fire Commissioner William Renaldo. "Even more importantly, it will result in better service for residents and business owners in the City of Buffalo." The flag taken down from the former Buffalo Police Headquarters was handed to Commissioner Byron Lockwood, who then explained it will be kept at the police department's new home. "Now it will have a place of honor in its display in this building. as a symbol of the past that calls us to look forward to the future of the continuing service to the City of Buffalo," Lockwood said. The current police commissioner also acknowledged two former commissioners, Daniel Derenda and Rocco J. Diina, both of whom were in attendance for the ceremony. The former Buffalo Police headquarters will soon be put up for sale, Mayor Brown said. One unresolved matter for police is where to place its new gun range. No such range is set up inside the new headquarters. A source with the mayor's office told WBFO several options are currently being explored. One of the speakers not previously scheduled to speak Thursday morning offered the perspective of a community still grieving from a mass shooting last weekend. Cantor Penny S. Myers of Temple Beth Zion, based in Buffalo and Amherst, represented Rabbi Jonathan Freirich, who was in Israel during the ceremony. Myers, alluding to the murders of 11 people at a synagogue in Pittsburgh, explained that as her synagogue hosts Sabbath on Friday evening, she knows the congregation will be safe. "They are safe because of the men and women who serve in the forces in our community. I am truly grateful," she said, before offering a Hebrew blessing. At a gathering Wednesday evening, there was enough wind to blow out memorial candles. Cops and civilians gathered to remember Buffalo Police Lt. Craig Lehner, who died a year ago during an Underwater Rescue Team training drill. It's been a long time coming. Buffalo Police have been headquartered out of the same building at Franklin and Church streets since the 1930s. On Friday, their new HQ opens to officers and the public. The Buffalo Police Department has started moving out of its longtime home at Church and Franklin streets. Crews began moving furniture and equipment in large trucks Monday morning.